Yes, Syracuse Basketball finally got an easy one on Tuesday against Cornell, dominating the first half and cruising through the second to take the game 78-58. Rick Jackson led the way (as usual) with 17 and 13, his sixth double-double in seven games. Kris Joseph put up his third straight quality game, with 16 points including 2-4 from beyond the arc. That early season 14% is inching up to respectability. But the story from Tuesday's game is not Joseph and Jackson, its the balanced offensive attack and contributions from unexpected sources. 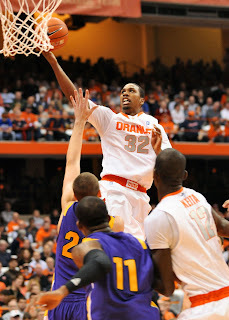 Fab Melo absolutely shocked the Dome, contributing 8 points, 7 boards and 4 blocks. He made mistakes and looked a step behind at times, but it was a huge, huge improvement over the first six games. Further surprises include Dion Waiters and Brandon Triche, who may be responding to some healthy competition for playing time. Waiters is earning more and more, with 11 points (3-4 from 3) and 4 assists. In addition, his active defense on the perimeter continues to impress. Triche struggled early but made some plays in the second half to turn in a respectable game. Is he feeling the heat? It was a nice, easy win for the Orangemen. Maybe a little too easy. Cornell shot only 33% for the game, a product of good defense no doubt, but they missed many open looks. The Big Red handed the Cuse this one on a silver platter. Hey, at least we accepted their offering with alley-oops and thunderous dunks. Oh, and if you've got a link to C.J. Fair absolute posterization midway through the second half, leave it in the comments. Dunk of the year, baby! 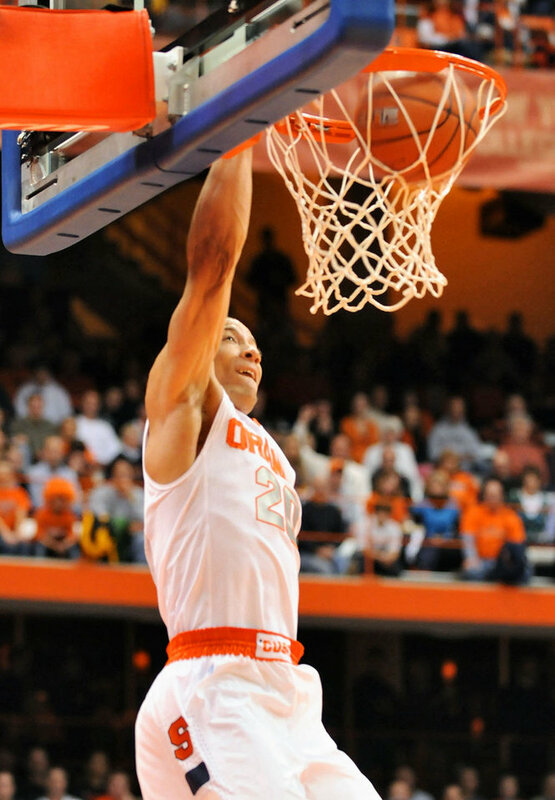 Tonight, the Syracuse Orangemen take on the Cornell Big Red at le Dome. While Cornell hasn't beaten the Orangemen since 1968, this annual tradition has been a rocky road for the Cuse for the last decade or so. Cornell has put together some good teams, even reaching the Sweet 16 last year, but they've suffered serious attrition in talent and leadership in 2010. I'm tempted to say this year would be different, and Syracuse would blow out the "rivals" from Ithaca that have lost to the likes of St. Bonaventure (at home), Lehigh and Boston University, but I'd be lying to myself if I thought anything would come easily to this team. In last year's contest against Cornell Brandon Triche scored 21 points. A sequel to that scoring performance is light years from from the realm of possibility based on what we've seen (or haven't seen) from Triche so far. What has happened to Brandon? He obviously doesn't have the same supporting cast, but its not like he's being relied on the score every time up the floor. Hell, its not ever points I'm after! Any kind of contribution would be out of character for Triche so far this season. Will Triche finally show up? Can Kris Joseph keep his streak of back-to-back good performances alive? Can we please get an easy one? Check back after the game for the Cuse Connection's post game thoughts and answers to these questions. The first installment of Cuse Connection Radio, recovered in the aftermath of the Orangemen's takedown of the Legends Classic tourney in AC. The majority of Syracuse seniors entered the Carrier Dome for the first time as athletes on August 31, 2007. On that Saturday on ESPN, Syracuse got smoked by the Washington Huskies 42-12. So, after a great turnaround season that found Syracuse 7-4 heading into the final Saturday of the season, its almost fitting that the seniors who debuted in that game are going out the same way, with a disappointing loss in the Dome. Its unfortunate it had to end like this. For many seniors this was a story book season. Doug Hogue and Derrell Smith dominated on defense. Delone Carter was running through the record books all year, passing legendary football names like Ernie Davis and Floyd Little on his way to his second 1,000 yard rushing season in a row. As a team, they turned a train-wreck of a program in to a competitive and exciting team to root for. After losing 8 or more games 5 seasons in a row, these seniors helped bring the Orangemen to the cusp of the Top-25 and gave Syracuse their first bowl eligible season since 2004. They started the season 6-2, however stumbled down the stretch when the injuries starting mounting. On the last Saturday of the season, Syracuse hosted former Big East conference member Boston College, and the Eagles showed the Orangemen what they've been up to the last few years. 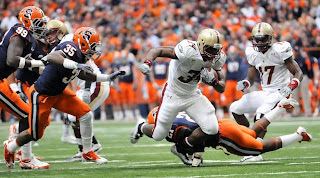 Boston College ran through Syracuse in the 2nd half en route to a 16-7 victory on the road. The loss gives Syracuse a final record of 7-5, losing 3 of their last 4 games of the season. Syracuse's defense stood as strong as it could in the first half, as the offense did not give them too much time on the sidelines to rest. The Orangemen held B.C. to just two field goals in the first half, however were unable to get anything going offensively. Syracuse entered the locker room down 6-0. The second half started out promising for the Orangemen. They went on an 80 yard, 5:21 second drive that was capped off with a 6-yard touchdown run by Antwon Bailey to give Syracuse a 7-6 lead. Unfortunately for Syracuse, Andre Williams was about to take the field for the first time in the 2nd half. And he would not disappoint the Eagles faithful. Boston College would score just 4:49 later on a 1-yard touchdown run by true freshman Andre Williams to give the Eagles a 13-9 lead. They would not look back. Williams finished with 185 yards on 42 carries, and was absolutely unstoppable for the Syracuse defense in the second half. Perhaps the defense was worn down after playing much of the first half, but either way they were unable to tackle the behemoth that is Andre Williams. Delone Carter was forced out of the game in the first half with some sort of undisclosed injury, and Antwon Bailey took over the rushing efforts for the Orangemen, finishing with 72 yards on 18 carries. Carter rushed 6 times for 30 yards. Ryan Nassib completed 15 of his 24 passing attempts for 147 yards and zero touchdowns with 1 interception. Marcus Sales, once forgotten receiver, lead the Orangemen for the 3rd week in a row with 5 catches for 73 yards. With that, the Syracuse Orangemen 2010 regular season comes to a close. They finish the year 7-5 and bowl eligible. After starting the season 6-2, Syracuse closed out the campaign with a very disappointing 1-3 record. However, a win in a bowl game will erase those feelings of angst. We find out where and when Syracuse will be playing their bowl game on December 5th, so be sure to check in with The Cuse Connection for a full breakdown of the bowl decision. It's been a memorable season for the Orangemen, one that this fan won't soon forget. Thanks to the players, the coaches, and the fans who made it out to the games. Syracuse University took care of business this weekend down in Atlantic City. Taking on Michigan in the Semi-Final round of the Legends Classic, Syracuse held on for a 53-50 victory lead by Kris Joseph's 22 point effort. Rick Jackson chipped in 10 points and 12 rebounds and Scoop Jardine had 11 points on 2-10 shooting from the floor. Freshman Fab Melo played 4 minutes. Michigan was able to hang around due in part to tremendous 3-point shooting in the first half. The Wolverines knocked down 8 three-point field goals in the opening half. However, the shots weren't falling for the Wolverines from beyond the arc in the 2nd half, and had Syracuse been able to make foul shots down the stretch of the game (sound familiar?) the final score wouldn't have been as close. Jordan Morgan and Stu Douglas both dropped 11 points for Michigan. The Wolverines held a 2 point lead at halftime, however Syracuse went on a 9-0 run early in the 2nd half to help the Orangemen pull out the victory. Michigan faced UTEP in the consolation round of the Legends Classic, and UTEP knocked off the Wolverines Saturday 65-56. It was a tough weekend for Michigan, as they also got stomped out in football against longtime rival Ohio State. Come Saturday night, there were zero Michigan t-shirts and hats on the Boardwalk. With UTEP playing in the consolation round, that meant that Syracuse would be facing Georgia Tech in the Finals of the Legends Classic. Once again Kris Joseph lead the Orangemen to victory, dropping 19 points on 5-7 shooting from the floor and 7-8 from the foul line. It was the most balanced scoring Syracuse has seen this season, as five players scored in double figures. Syracuse defeated Georgia Tech 80-76, behind 55.6% shooting from the floor. Rick Jackson had another 10 point night to go along with 14 rebounds and 2 blocks, earning him Legends Classic Tournament MVP honors. Scoop Jardine added 15 points, giving the boys from Philadelphia, which is just under an hour away from Atlantic City, reason to smile. Freshman Dion Waiters had a tremendous first half and finished with 13 points in 14 minutes, making 5 of his 7 shots from the floor. C.J. Fair had 10 points and Baye Moussa Keita had 4 points and 3 rebounds on the night. It was a 3-pointer by C.J. Fair with 11 seconds left in the first half that gave Syracuse a 38-36 halftime lead. Georgia Tech's Brian Oliver scored a career high 32 points, and mugged Kris Joseph late in the game with a very hard foul under the basket. Thankfully Kris Joseph only needed a couple minutes to catch his breath on the bench and returned to the game moments later. After the game Jim Boeheim said Joseph hurt his chest, but was fine. Fab Melo followed up his 4 minute stint on the floor Friday night with 10 minutes on Saturday night. Syracuse emerges from the weekend 6-0 overall this season and with the Legends Classic Trophy. 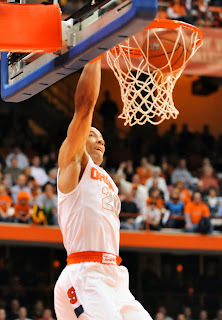 Up next for the Orangemen is Cornell University on Tuesday in the Carrier Dome at 7PM. Cornell is 2-4 this season. Steve Donahue is out as head coach of the Big Red, as he took over the coaching duties for Boston College following Cornell's surprise Sweet 16 appearance. Bill Courtney, former UVA and Virginia Tech assistant coach, is now the head coach of Cornell. Ya, they blew up his house too. Gonna see what them Orange boys can do. And Bernie Fine can't get no relief. This weekend the Syracuse Orangemen basketball team will leave the usually friendly confines of the Carrier Dome and venture out on the road for the first time this season. "Usually" being the key word here, as Syracuse has struggled shooting the ball inside the Dome through the early part of the season. In Sunday's nail-biter against lowly William & Mary, Syracuse shot just 36.7% from the field. Additionally, the Orangemen have only made 12 of 52 shots from beyond the arc this season (23.07%). Thankfully, Syracuse gets a chance to shed those home shooting woes and take their show on the road. Jim Boeheim's crew is heading to Atlantic City, NJ for a two-game set in the Legends Classic. Beginning Friday night at 8PM Syracuse takes on the Michigan Wolverines at Boardwalk Hall. Also playing at 5:30PM is UTEP v. Georgia Tech. The winners meet on Saturday at 8PM. The losers will play before the "championship" game at 5:30. Many people have been wondering why Syracuse has struggled shooting the ball early this season. One possible explanation is the 'home court advantage' the Carrier Dome lends the Orangemen. The cavernous sight lines which throw off visiting teams shooters could be hurting the home team. Thus, Syracuse could be falling victim to their own home court advantage. Syracuse has been practicing at the brand new state of the art Melo Center, a much smaller facility than the Dome. Perhaps they need more time practicing shooting in the Dome. Perhaps they are just playing down to their competition. Either way, the boys from Syracuse are going to get a chance to shoot in a much smaller gym this weekend in Atlantic City's Boardwalk Hall. We will watch and see if it has any effect. The Orangemen need to get their confidence going. Most importantly Fab Melo, who has struggled mightily. Good news for Melo is that he shouldn't get pushed around inside, as Michigan doesn't have a player taller than 6'10". 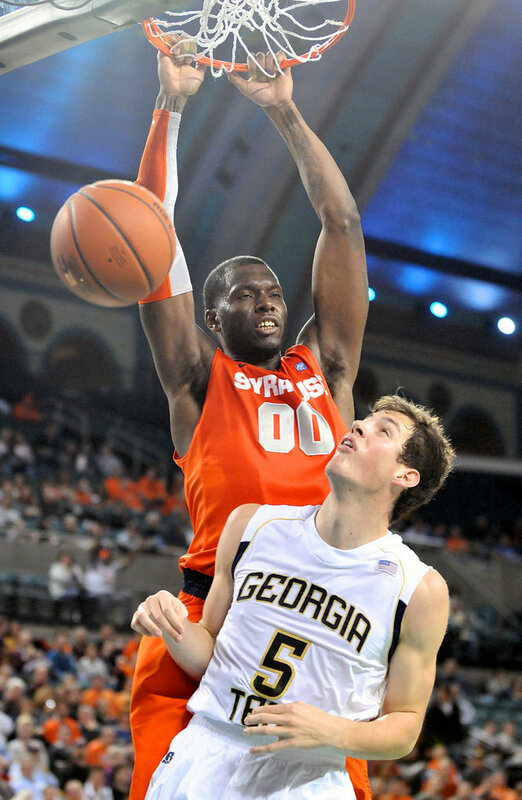 If he does continue to struggle, Baye Moussa Keita will come off the bench and give Syracuse quality minutes. Through all the questions and poor shooting, Syracuse has still found a way to jump out to a quick 4-0 record. Michigan has gone 3-0, with wins against USC Upstate, Bowling Green and Gardner-Webb. Their average margin of victory has been 24 points, and they have yet to trail at the half to any of these opponents. Syracuse can not expect a team that will just roll over and allow Syracuse to take the game to them. The Wolverines are a very good rebounding team and Syracuse will have to scrap with them underneath if they want to come away with the loose ball. Zack Novak and Jordan Morgan are each averaging 7.3 rebounds per game, and Morgan is also averaging 12 points per game for the Wolverines. Tim Hardaway Jr. is averaging 14.3 points per game and Darius Morris has chipped in an average of 14.7 points to help lead the Wolverines to their 3-0 record. Darius Morris has turned the ball over 7 times in 3 games, however he has also dished out 25 assists in the same time frame. If Syracuse protects the basketball, limit turnovers and 3-point attempts, and is able to knock down open jumpers, they should be able to prevail against Michigan and play in the late game Saturday night. The Cuse Connection will be tweeting live from Atlantic City all weekend. Additionally, baring any technical difficulties, there will be a podcast coming at some point Friday or Saturday, previewing the weekends events and discussing all things Orange. Please follow @CuseConnection on twitter to stay up to date on all the latest happenings from Atlantic City this weekend. It seems like just yesterday we were settling in to watch the opening game against Akron. It was September 3rd, and Syracuse would go on to win their season opener for the first time since the 2003 season. It's been that kind of year. The kind of season where everywhere you turn, Syracuse was doing something they hadn't done since 2001, 2003, 2004. Every week was another benchmark achievement. When the Orangemen jumped out to a 3-1 mark, it was the first time since 2003. When Syracuse defeated South Florida, it was the first time the program was 4-1 since 1999. Defeating West Virginia on the road? Hadn't happened since 2000. Going to a bowl game? Not since 2004. Winning 7 or more games in a season? Not since 2001. So Saturday, Syracuse wraps up this season of "first time since's" when Boston College enters the Carrier Dome, for the first time since 2003. The last time the two squads squared off was November 27th, 2004, six years to the day. On that fateful day, Syracuse stomped out BC 43-17 on the road, preventing Boston College from going to their first ever BCS bowl game in the school's history, and sending them out of the Big East without the Conference title. After the game, Diamond Ferri, who was superhuman on that day, stated "If they want to leave the conference, we wanted to send them out with a loss." No one could have predicted this though. Diamond Ferri, filling in for an injured Damien Rhodes and Walter Reyes, ran for 141 yards on 28 carries and two touchdowns. He wasn't finished. He was still playing defense and intercepted Matty-Ice in the 4th quarter, returning the ball 44 yards to the house. For his efforts, Diamond Ferri was named Big East Offensive and Defensive player of the week. With that, Syracuse and Boston College's 45 game series (Syracuse has the edge 28-17) came to an end. After a six year hiatus which saw Syracuse get run into the ground by some clown currently "coordinating" the Michigan Defense, and Boston College defect to the Atlantic Coast Conference, the rivalry resumes on Saturday in the Carrier Dome at 12PM. The game will be televised live on ESPN. Since departing the Big East, the Eagles have enjoyed some success on the field. They have gone to the ACC Championship game twice and have posted winning records each season since the defection. This year however, they have had somewhat of a down season. Boston College is 6-5, and went 4-4 in the ACC. They haven't beaten any ranked teams, and their offense is ranked in the 90s for the majority of offensive categories. Boston College's starting running back Montel Harris is out with a torn left lateral meniscus, so his 1,243 yards on 269 attempts and 8 touchdowns won't be an issue. True freshman Andre Williams will take his place. He has 206 yards on 34 rushing attempts and no scores, yet. Syracuse fans shouldn't hang their hat on the fact that the star RB is out for BC, seeing how well Bilal Powell of Louisville's back up performed in the Carrier Dome a few weeks ago. Boston College's quarterback is Chase Rettig. Thankfully, Syracuse's defenders know how to handle a QB with the first name Chase, or Chas (same difference). Rettig has completed 75 of 142 attempts for 1,007 yards and 6 scores. He has also thrown 6 interceptions and been sacked 13 times. Chase Rettig has won 4 straight starts to help save the season for Boston College. The main receiving target for the Eagles is Bobby Swigert (6'1" 180 pounds). Swigert has 33 catches for 476 yards and 4 touchdowns. Alex Amidon (5'11" 185 pounds) has 11 catches for an amazing 301 yards and two touchdowns. He made 3 catches for 102 yards in a game against North Carolina State this year. Tight end Chris Pantale (6'6" 244 pounds) has 24 catches this season for 225 yards and 1 touchdown. Additionally, Ifeanyi Momah (6'6" 228 pounds) has 19 catches for 296 yards and 3 touchdowns. Don't ask me how to pronounce that name because I have no idea. Boston College's defense has averaged 20.6 points per game against, which ranks 31st in the country. They also allow an average of 316.5 total yards per game, 16th best mark in the nation to go along with 18 interceptions this season, which is tied for 3rd most in the country. With Boston College averaging 1.6 interceptions per game, Ryan Nassib will have to be sharp if Syracuse wants to win this game. Nassib has completed 174 of 313 passing attempts this season for 1,948 yards and 16 touchdowns. 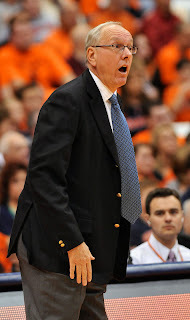 He has helped steer the Orangemen to a 7-4 overall record and 4-3 in the Big East. Unfortunately for Nassib, he hasn't looked great at home since the beginning of the Big East schedule. Luckily for Syracuse, this isn't a Big East game anymore. Syracuse was 0-3 at home this year against conference opponents. No word yet on how well they perform against "former" conference teams, however against non-conference teams Syracuse is 2-0 at home. Delone Carter enters the Dome with 1,005 rushing yards on the season, and 59 yards away from passing Larry Csonka on Syracuse's All-Time Rushing Leaders list for 3rd place All-Time. Helping out of the backfield is Antwon Bailey, who has 432 yards on 89 carries and an additional 29 receptions for 252 yards, with 4 combined touchdowns. Van Chew continues to lead the receiving corp, however he has been getting increased help from tight end Nick Provo. Over the last two weeks, Marcus Sales has stepped up and asserted himself as a reliable member of the group, pushing his season total to 16 catches for 169 yards. He has lead the Orangemen in receiving yards the last two weeks. Alec Lemon was held to just one catch last week after missing the Rutgers game, and seems to still be feeling some effects of the arm injury that kept him out of the game in Piscataway, NJ. Syracuse's Defense have been the story this season. Ranked 13th in points against, they have allowed just 18.3 points per game. With an average of 293.2 yards per game against, the defense ranks 6th in the nation in yards allowed. Syracuse's secondary has done a tremendous job, allowing just 161.9 yards on average per game, and are 9th in total passing yards allowed in the country. If Syracuse can stop the run, which they have failed to do in the last two home games against Louisville and Connecticut, they should be able to pull off the victory Saturday. Saturday is a Syracuse sports fan's dream. The day will start at 12:00PM with the Syracuse-Boston College football game on ESPN and then will be followed at either 5:30 or 8:00 (depending on Friday's outcome) with a basketball game from the Legends Classic in Atlantic City. With a win, Syracuse would finish this memorable season 8-4. Not to be forgotten in all this is the fact that it is also Senior Day in the Carrier Dome. Doug Marrone stressed the importance earlier this week of sending our boys out the right way, with a victory. These seniors endured two years of misery under Greg Robinson and a year of rebuilding the program under Doug Marrone. They emerged from it with the chance to finish their final season of college football with an 8-4 record and have earned the program's first trip to a bowl game since 2004. No matter what it was a season to remember for all the players, not just the seniors, but these seniors deserve to play their last game in the Carrier Dome the right way. In front of a sell out crowd and with a victory! The Aftermath of the William & Mary "Victory"
In the aftermath of an extremely upsetting 63-60 victory over the William & Mary Tribe, a school beat thoroughly by the likes of the University of Virginia Cavaliers and the Richmond Spiders, one has to step back and reflect upon what we have witnessed so far this season. 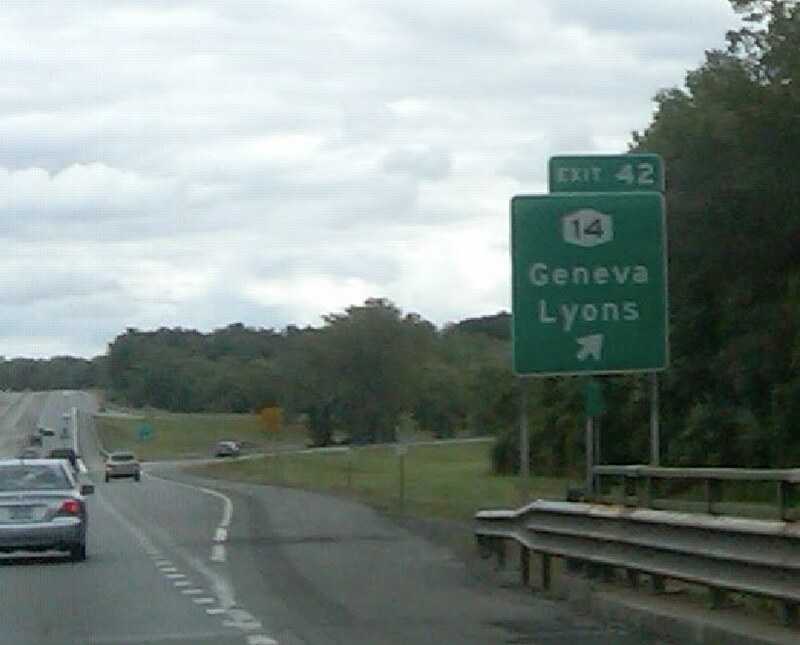 The first thing that jumps out at you is that this Syracuse team has no killer instinct. They simply can not put a team away. The Orangemen had an early 10 point lead in the game on Sunday, however allowed William & Mary to scrap back into it with missed shots, missed rebounds, and lackluster offense. The Orangemen would go into the half up just two points (32-30). Syracuse would also build a 9 point second half lead, which the Tribe turned into a 4 point lead of their own with under 3 minutes to play in the ball game. If Syracuse wants to be successful this year, they are going to need to get a lead, and keep tacking on points. You simply can not let teams hang around, because they will start making shots and then the pressure is on the Cuse to respond. Jim Boeheim's squad got lucky on Sunday, with William & Mary stepping out of bounds in the final seconds with the ball and a chance to tie or take the lead. That most likely will not happen again. Kris Joseph responded from an exceptionally poor game against Detroit last Tuesday with an 18 point effort on Sunday. Joseph finished 5-12 from the floor (0-3 from 3-point range) with 7 rebounds, 4 assists, 1 block, 1 steal and zero turnovers in 34 minutes. That's the effort Syracuse is going to need to get from Joseph if they want to win ball games this season. However it can't just be him. They need a balanced scoring attack, and they need to limit the 3-pointers. Scoop Jardine, who had 27 points against Detroit, chipped in 11 on Sunday and shot just 4-17 from the floor, 3-10 from 3-point range. If you take out Scoop's 10 attempts, Syracuse shot 2-12 from long range. The more Syracuse misses 3-pointers, the more teams will play off them and allow the long range shot in favor of having numbers under the basket for the rebound. William & Mary did it, and successfully. The smaller Tribe team managed to equal Syracuse in rebounds for the game, 37 apiece. If the Tribe can figure it out, assume other Big East school's and Tom Izzo will figure it out as well. Perhaps the Orangemen could use a road trip. A chance to bond as a team away from the distractions of the University and the wide sight-lines of the Carrier Dome. 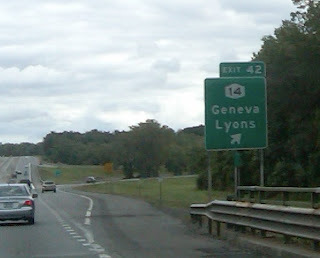 Luckily for them they have a chance to spend a weekend away from Syracuse beginning this Friday in the Legends Classic. Taking place in Atlantic City, Syracuse will meet the Michigan Wolverines Friday night at 8PM at Boardwalk Hall. They will then meet the winner/loser of the UTEP-Georgia Tech game on Saturday night. I'd like to say that it's a given Syracuse will beat Michigan and play the late game Saturday night. Three weeks ago I would have. However, after watching Syracuse stumble all over themselves to a 4-0 season record, saying Syracuse can win on Friday night couldn't be further from a guarantee. Michigan is 3-0 right now, with victories against college basketball powerhouses USC Upstate (66-35), Bowling Green (69-50) and Gardner-Webb (80-58). As bad as Syracuse fans want to believe the Wolverines might be, they haven't trailed at the half to any scrub teams, nor have they been losing with under 3 minutes left in a game to a team that had yet to lose by less than 20 points this season. Whether or not Syracuse can find their offensive game this weekend in Atlantic City will be the turning point for the season. If the Orangemen were to fall to the Wolverines on Friday night, the remaining non-conference schedule could get ugly, and it won't be any prettier once the conference games begin. Confidence would be low, team morale might be lower, and many Syracuse fans across the country would be heartbroken. 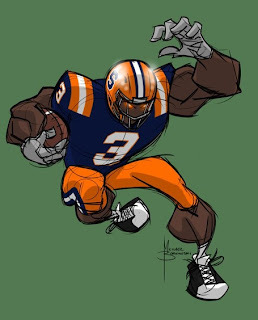 However, if Syracuse can win big against both opponents this weekend at the Legends Classic, it might give them the confidence they will need to beat North Carolina State and Michigan St. and springboard them into the conference slate of games with some moxie and swagger that they desperately need. In a surprise move, given that there is only 1 week left in the regular season, Doug Marrone has chosen to "part ways" with Assistant Coach Bob Casullo. According to HCDM, "Bob and I have decided that it's in the best interest of the program to part ways." Casullo rejoined the Syracuse University community after holding coaching jobs at Georgia Tech, Michigan State, and numerous NFL coaching positions. He was asked by Doug Marrone to join him on the Hill last season to help restore the Orangemen tradition. Casullo coached Special Teams and Tight Ends. John Anselmo, defensive backs coach, will take over the Special Teams coaching duties and Quarterback coach Nathaniel Hackett will add Tight Ends to his responsibilities. It's a surprise move considering there is just one week left in the regular season. With Syracuse going to a bowl game for the first time in what feels like a decade, one would have assumed that Marrone would have kept Bob Casullo along for the ride. However, with special teams being an extremely disappointing area of the football program going back to last season and carrying over into this season, many observers felt that Casullo would not be back for the 2011 season. It's an early move, but a move that had to be made. If Syracuse wants to beat Boston College and whoever they will face in a bowl game, they will need the offense, the defense and the full potential of the special teams unit to be successful. After rushing for 85 yards on 18 carries in Piscataway, NJ on November 13th against Rutgers, Delone Carter rushed for 67 yards on 19 attempts in the Carrier Dome on Saturday in Syracuse's Big East finale against the Connecticut Huskies. His efforts earned him 1,005 yards on the ground this season, Carter's 2nd straight 1,000 yard season. It is the 14th time in school history a running back has rushed for 1,000 yards in a season. The total also gives Delone Carter 2,876 career rushing yards, which moves him past the #4 All-Time leading rusher at Syracuse University, James Mungro. DC3 is now 58 yards behind the #3 rusher on the list, football legend Larry Csonka. Between 1965 and 1967 Larry Csonka rushed for 2,934 yards on 594 carries at Syracuse University. In 1967, Csonka was named the ECAC Player of the Year and drafted 8th overall in the 1968 NFL draft by the Miami Dolphins. Inducted into the Pro Football Hall of Fame in 1987, Csonka played 11 years in the NFL for both the Dolphins and the NY Giants. He was a key member of the undefeated Dolphin team of 1972, and was the Super Bowl MVP in 1974 with 145 yards and two touchdowns in the Championship game against Minnesota. If Delone Carter can pick up 59 yards in the finale this coming Saturday against Boston College, he will solidify himself as the 3rd leading rusher in Syracuse Orangemen football history, with his name along side Joe Morris (4,299) and Walter Reyes (3,424). It was a game like many other home Big East football games for the Orangemen this season. The student section didn't show up, the Orangemen's offense was flat, and the opposing team was running all over the place. Where were the students? 7PM on a Saturday night one would think they would be available for a few hours to root on their school, a week after clinching bowl eligibility. I guess there must have been an early showing of Harry Potter because clearly there was somewhere else they would rather be. Connecticut got on the board first with a 1 yard touchdown run by Jordan Todman with 5:16 left in the first quarter. Todman, the 7th leading rusher in the country, picked up 44 yards on the drive to help give the Huskies the early lead. Syracuse scored on the next drive, however the Cuse were unable to put the ball in the end zone after driving to the UCONN 32 yard line. The Orangemen were forced to settle for a 42 yard field goal by Ross Krautman, which cut the lead to 7-3. Connecticut would respond with a field goal of their own late in the first half. Ryan Nassib got picked off at his own 38 yards line with just 3:10 remaining in the half. The Orangemen D allowed the Huskies to convert on a 4th and 6 from the 34 yard line, however ultimately held UCONN to a field goal with just 36 seconds remaining in the half. Connecticut entered the locker room at the break up 10-3. Syracuse would cut the lead to 10-6 following a fumbled punt return by the Huskies early in the 3rd quarter. Syracuse recovered the botched punt at the Huskies 31 yards line, but were once again unable to punch the ball in. Ross Krautman connected on a 35 yard field goal. It was Krautman's 16th straight field goal made, and cut the lead to 10-6. Syracuse would not score again the rest of the game. Jordan Todman would go on to score on another short touchdown run to give him two on the day late in the 3rd quarter. He finished the night with a game high 131 yards on 27 carries and 2 touchdowns. Syracuse's passing defense limited Zach Frazer to just 13 completions on 21 attempts for 97 yards and zero touchdowns. However, Syracuse's inability to stop Jordan Todman and their difficulty scoring touchdowns was the difference in the game. Antwon Bailey had just 1 carry for 1 yard, however he did catch 4 passes for 24 yards. Delone Carter finished with just 61 yards on 18 carries for the Orangemen. He now has 1,005 yards on the season and 2,876 yards in his career. It's Carter's second straight 1,000 yard season and moves him into 4th place on Syracuse's All-Time rushing list, 7 yards more than James Mungro. Ryan Nassib finished the evening with 20 completions in 36 attempts for 170 yards, zero touchdowns and 1 interception. It was Ryan Nassib's first game without a touchdown pass this season. He completed passes to a season high nine different receivers, with Marcus Sales leading all players with 6 catches for 56 yards. Van Chew grabbed 3 balls for 29 and injured Alec Lemon picked up 1 catch for 12 yards in limited action. With the loss, Syracuse finishes the Big East season with a respectable 4-3 record. However, considering the Orangemen went 4-0 on the road this season with wins against West Virginia, Cincinnati, South Florida and Rutgers, its pretty shocking they couldn't manage 1 Big East win at home against Pittsburgh, Louisville and Connecticut. Syracuse is now 7-4 on the season and will host former Big East school Boston College this Saturday in the regular season finale at noon on either ESPN or ESPN2. UCONN improves to 6-4 this season, 3-2 in the Big East. The Huskies earned bowl eligibility in the win. 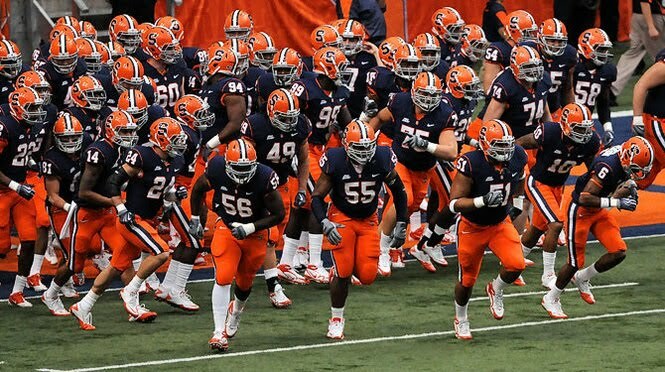 On Sunday the Syracuse Orangemen will host the William & Mary Tribe in the Carrier Dome at 2PM. Syracuse is 3-0 on the season, and looking to improve on an absolutely dreadful shooting performance Tuesday against Detroit. The Tribe are coming to Syracuse after losing on Monday to the Richmond Spiders 73-49 and are 0-2 on the season. William & Mary also lost to the University of Virginia 76-52 in their season opener. 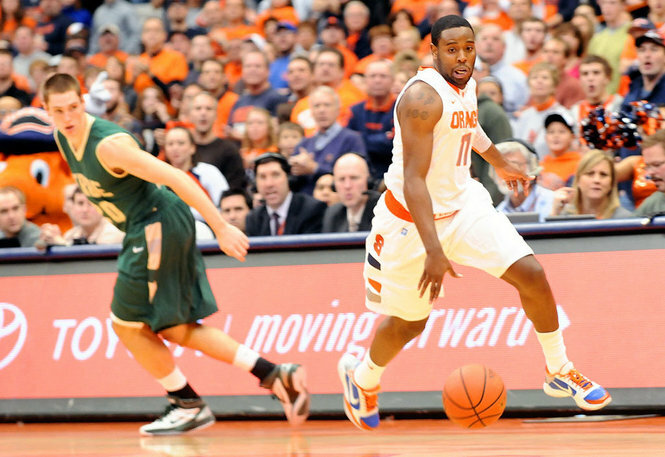 William & Mary come into the Dome at a perfect time for Syracuse. Currently, the Orangemen are searching for a consistent offense, and due to the Tribe's poor defense so far this season they could be just what the doctor ordered. W&M have allowed opponents to shoot 52.4% from the floor and 44.7% from 3-point land. The Tribe are also averaging 11 turnovers per game and have only blocked 1 shot so far this season. On offense, Marcus Kitts (6'9" 230 pounds) is currently their leading scorer averaging 13 points per game and 7.5 boards. Against Richmond, Kitts dropped 16 points and added 13 rebounds for the Tribe. Quinn McDowell (6'6" 212 pounds) is the 2nd leading scorer averaging 11.5 points, 4 rebounds and 1 assist per game. McDowell had 16 points 5 rebounds against Virginia in the season opener, however he was held to just 7 points against Richmond. Lastly, Kyle Gaillard (6'7" 210 pounds) is averaging 10.5 points 3 rebounds and 2 assists per game. Gaillard is shooting 56.3% from the floor this season. John-Mark Ludwick (6'8" 230 pounds) is a 3-point threat, knocking down 4 of 9 attempts in the season opener against Virginia. He was held to just 3 points on 1 of 2 shooting in the Richmond game. Syracuse will try to get the rest of the team going after a strong performance by both Rick Jackson (10 points 22 rebounds) and Scoop Jardine (27 points 8 assists) in the game Tuesday against Detroit. Aside from the aforementioned pair, no other Syracuse player made more than 2 shots from the floor. We can harp on who played bad and why Jim Boeheim called the team "overrated" all day, however the important thing is that the Orangemen use this game as a springboard to get their confidence and their swagger back before a tough stretch of games on the horizon. After Sunday, Syracuse will travel down to Atlantic City, NJ on November 26th for a pair of games in the Legends Classic at Boardwalk Hall. Ten days later, Syracuse will travel to Madison Square Garden and take on the #2 team in the country, the Michigan State Spartans. If all of Syracuse's bugs haven't been worked out before that date, there's a chance they could be embarrassed on what everyone likes to call their 2nd home court. No body wants to see that. This is essentially the last chance for the bench players and freshman to show Coach Boeheim they can be trusted on the court. If they can't use this game to step up and perform at the level they are expected, then certain players will be enjoying the remainder of the games from a very good seat on the floor. Tip-off on Sunday is 2PM and is scheduled to be on The Big East Network, SNY. However, at 2:00 on the channel guide it says that the Miami vs. Rutgers basketball game will be on, and that Syracuse v. William & Mary will be televised at 5:00PM on SNY (tape delay). Not sure if the game will be available anywhere else to watch live, but we will share that information when it becomes available. Those of us who are die-hard fans can probably find a radio link on the internet where we can listen live and then re-watch the game later. 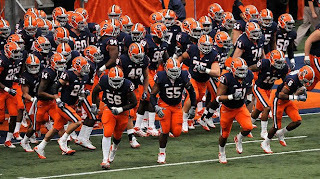 This Saturday the Syracuse Orangemen will host the Connecticut Huskies in the Carrier Dome at 7PM. Syracuse will look to improve to an improbable 5-2 record in the Big East with a win and the game will be televised nationally on ESPNU. Connecticut comes to the Dome with a 5-4 overall record, 2-2 in conference play. 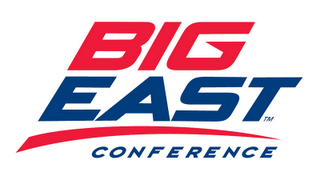 Good news for the Orangemen: Connecticut is 0-4 on the road this season in the Big East. 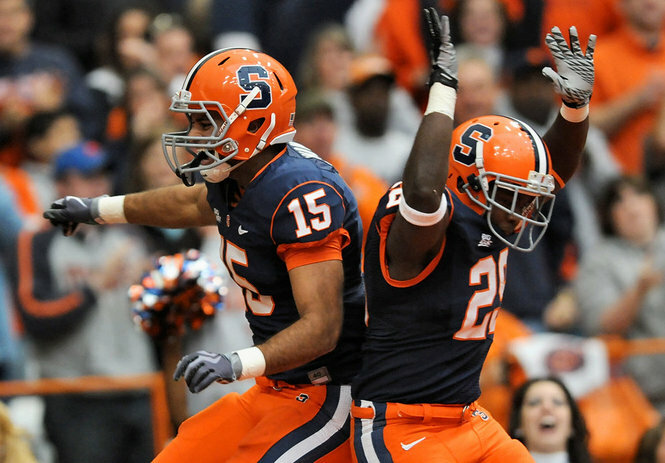 In an interesting twist of fate, Syracuse's two conference losses both came at home, and they were undefeated in 2010 on the road in the conference. Last week, Syracuse clinched bowl eligibility for the first time since 2004 with a 13-10 victory over the Rutgers Scarlet Knights. Connecticut spent their Saturday pulling out a huge upset win against the Pittsburgh Panthers 30-28, behind 222 rushing yards by Jordan Todman. After the game Randy Edsall performed this little dance number in celebration. Last season Syracuse traveled to East Hartford and were defeated by the Huskies 56-31, in a game many felt former Syracuse Football player and current Huskies head coach Randy Edsall ran up the score late in the game. This year Syracuse has a chance to return the favor and close out the Big East schedule in style with a victory against a head-to-head recruiting rival. Connecticut is lead into the Dome Saturday by Jordan Todman, star running back. Todman currently has 1,176 yards in just eight games and 9 rushing touchdowns. Jordan Todman also has 15 catches for 97 yards and is currently the 7th leading rusher in the nation. He is definitely the biggest threat on this offense and needs to be stopped in order for Syracuse to prevail. The Huskies passing attack starts with senior quarterback Zach Frazer, who hasn't exactly set the college football world on fire this season. He has completed 80 of 148 passes for 871 yards and 4 touchdowns (2 interceptions). With Syracuse paying obvious attention to Jordan Todman, they will be daring Frazer to beat them. Hopefully the secondary is ready. Todman has almost rushed for as many yards himself as the entire Huskies team has in receiving yards this season (1,176 to 1,410). Leading wide receiver for the Huskies is Michael Smith (6'1" 202 pounds) who has 30 receptions for 470 yards and 2 touchdowns. He was held without a catch last week against Pittsburgh. Kashif Moore (5'9" 180 pounds) is the second leading receiver with 28 catches for 361 yards and 4 touchdown catches. Lastly, Syracuse needs to watch for tight end Ryan Griffin (6'6" 243 pounds) who has 19 catches for 135 yards and 1 score. On defense the Connecticut Huskies have given up an average of 22.1 points per game, which ranks 43rd in the country. They allow 364.1 yards per game on average, which is 56th in the nation. The Syracuse Orangemen defense allows just 297.1 yards per game, which is amazingly 9th best in the country. 17.8 points per game allowed is 12th best in the country and Syracuse's passing defense is a tremendous 12th best in the country as well, allowing just 168.3 yards per game. The most important facet of the defense on Saturday will be the run defense, which is 31st best in the nation right now, averaging 128.8 yards per game. Ryan Nassib currently has 1,777 passing yards, completing 154 out of 277 attempts and 16 touchdowns. Nassib has throw at least 1 touchdown pass in each game this season and has thrown just 6 interceptions. Delone Carter and Antwon Bailey have continued to be a two headed monster for the Orangemen, with DC3 averaging 5.2 yards per carry and Bailey carrying a 4.9 yards per attempt average. Good news for the Orangemen, Prince-Tyson Gulley is back on the practice field this week, seemingly fully recovered from his bout with mono. His status for the game on Saturday isn't officially known, but it is a good sign to see him back out there. After sitting out last weeks game, Alec Lemon is expected to play Saturday. Lemon has 29 catches for 365 yards and 4 touchdowns. Van Chew is leading the Cuse with 36 catches for 563 yards and 5 scores and tight end Nick Provo has emerged a viable receiving option, catching 29 balls for 322 yards and 1 touchdown this season. This past Saturday, Marcus Sales re-established himself as a weapon for the Orange passing attack, hauling in 5 balls for 73 yards against Rutgers. With a win on Saturday, Syracuse can improve to 8-3 on the season and finish the conference schedule at 5-2. With a win they can finish no worse than 2nd in the Big East, a conference that many "experts" predicted Syracuse to finish in 7th place. Connecticut will look to keep their post-season hopes alive with a win and try to earn favorable positioning in the Big East standings with a win. Bud Tribbey, Syracuse nose tackle who sat out against Rutgers last week, is expected to play. The game kicks off at 7PM and will be televised live on ESPNU. Tickets are still available and if you are in the area, find a way into the Carrier Dome! Be sure to check back with The Cuse Connection for a complete post game report and analysis following the game. Syracuse basketball is 3-0, and on the surface it looks like the team has picked up where it left off prior to the unthinkable loss to Butler in the Sweet 16 of the NCAA tournament. However, when you take a closer look it appears that not everything is going according to plan. The Orangemen are averaging 11 turnovers per game. Mind you this is against Northern Iowa, Canisius and Detroit. Brandon Triche is leading the team with 8 turnovers, while Kris Joseph Scoop Jardine and Rick Jackson each have 6 turnovers through three games. If Syracuse can not protect the basketball versus early non-conference opponents, they could be in for a rude awakening once teams like Michigan, North Carolina St. and Michigan St. come up on the schedule in a few weeks. The most glaring disappointment is in the teams shooting, particularly in the first half. Coupled with the turnovers, opponents have held Syracuse to points of 23, 32 and 25 in the first half of games. All at home. All against considerably weaker opponents. What's to make of this? First off Syracuse is settling for outside jumpers extremely early in the shot clock. Playing these smaller teams early in the schedule, Syracuse needs to run the offense. The guards have to feed the ball inside to the big men, and if the other team collapses underneath, they have to kick the ball out and penetrate. At this point when the ball gets kicked out, the guards are hoisting up 3-pointers like they are Gerry McNamara or Preston Shumpert, when in reality they don't have the range or ability to be taking that many shots from long range. Against Detroit Syracuse attempted thirty 3-pointers!! They made seven. The truth is Syracuse is too athletic and too big to be averaging twenty-four 3 pointers per game against lesser competition! They need to use their size and speed to get to the rim, not waste it standing at the perimeter a la Donte Greene. 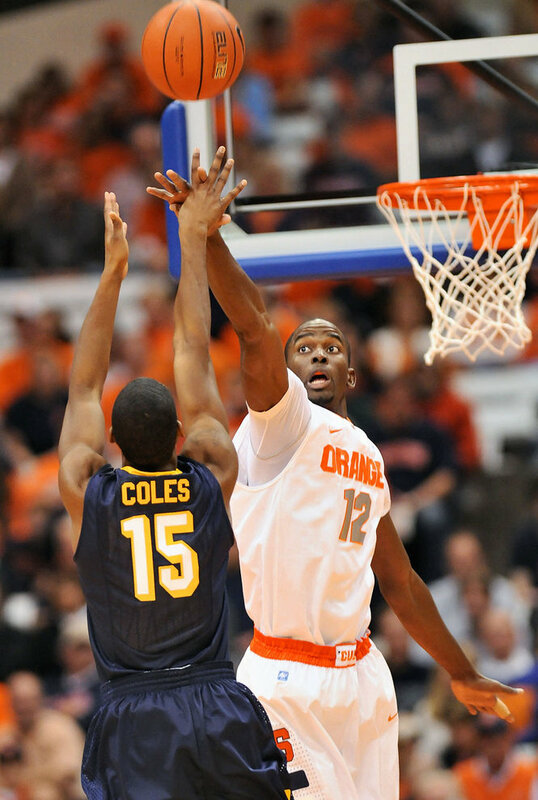 James Southerland is 6'8" and he has taken 13 of his 20 shots from the floor behind the arc! He needs to take that length to the rim and be in position to get some rebounds and some easy buckets. Especially a guy who went 1-8 from 3 against Detroit in just 16 minutes. Kris Joseph currently has taken 11 of his 23 shots from the floor from 3-point range (47.8%). He has made just two of them. Since when is Kris Joseph a 3-point assassin? Last season Joseph took 41 3's and hit 9 (22%). Now I don't doubt that Joseph has been working on his outside shot, and I guess that its a good time for him to practice taking 3's against bad teams, but come on! Through 3 games he has taken 12 shots from inside the 3-pt. arc? Four shots per game?! That's not going to get it done. Fab Melo hasn't been the star-studded freshman that many pundits lead us to believe, and frankly I am not surprised. If you read The Cuse Connection season preview, we believed that Riley would be the starting center as Melo would need time to adjust to the college game. He has only played basketball in America one season. Almost every freshman in the country has played four years of high school basketball, Fab Melo has played one. However, circumstances being what they are Melo was thrust into the starting roll and he should not be crucified as a "bust" just yet. He is simply finding his way and its taking some time. "One and done" are words that will be removed from his vocabulary. They should be replaced with defensive positioning, footwork, and patience. There have been some pleasant surprises. Scoop Jardine is evolving into a leader on the floor and Rick Jackson has been an absolute beast for the Orangemen. Off the bench, Baye Moussa Keita is probably the most pleasant surprise of the season. Its scary to think where we would be without Keita. Versus Canisius Baye Moussa Keita dominated the paint so hard he picked up 15 rebounds in just 17 minutes on the floor. C.J. Fair has also been a welcome addition to the team. He is one of the few players on the team that gets the ball and drives to the hoop, and it shows in his shooting percentage. Fair is 8 of 12 from the floor and 5 of 7 from the foul line. He is currently averaging 7 points and 3.3 rebounds in 11.3 minutes per game. He is also one of the few players on the team not to attempt a 3-point field goal yet this season. As long as Syracuse can settle down with the ball, run the offense, and get easy points inside rather than taking an average of twenty-four three pointers per game, Syracuse can be successful this season. The team defense has been good and can only improve once the Orangemen start clicking on all cylinders offensively. The Orangemen have held opponents to just 32.6% from the floor and 22.7% from behind the arc. Opponents are also averaging 14 turnovers per game. Those are good numbers, however our offense needs to become more efficient. With just William & Mary standing between Syracuse and the tougher part of the schedule, now is the time to get these kinks out of the system and find our true offensive game. To answer the question posed in the headline, should we be worried? Honestly, if we keep trying to take 20-30 three pointers per game, yes. However, once this team realizes that there are no Andy Rautins' or Gerry McNamara's standing on the perimeter and that they have to lower the shoulder and take it to the hoop, the Orangemen will be just fine. HAPPY BIRTHDAY JAMES ARTHUR BOEHEIM!! On this date in 1944, James Arthur Boeheim was born in Lyons, NY. 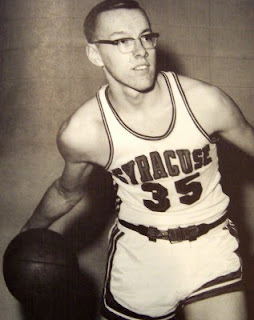 Jim Boeheim graduated from Lyons Central High School and enrolled at Syracuse University in 1962. In his freshman year he walked-on the SU Basketball team and by his senior year he was named a captain of the team. Along with Dave Bing, Jimmy B and the Orangemen went 22-6 in his senior season and went to the NCAA tournament for only the 2nd time in school history. Jimmy B. wanted to get into coaching and was hired as a graduate assistant at Syracuse. After another extremely frustrating first half for the Orangemen, Syracuse regrouped in the locker room and came storming out of the gates for the second half. Syracuse outscored Detroit 41-27 in the second half and held on for the 66-55 victory in front of 17,379 fans in the Carrier Dome. The boys from Philadelphia were on fire on this night. Without Scoop Jardine and Rick Jackson there is no way Syracuse could have survived this game. After being down 3 points at half time, Scoop Jardine put the team on his back and scored 12 points in the first 6 minutes of the second half en route to a career high 27 points on the night. Scoop also picked up 8 assists and 5 steals. 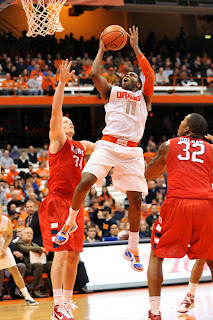 Rick Jackson scored 10 points and had a career high twenty-two rebounds for the Orangemen. After the game, Jim Boeheim said "If Scoop didn't pull us on his shoulders and take the game over, we have no chance. He just decided he was going to win this game by himself." Unfortunately, the accolades end there for the Orangemen. Aside from the "Philadelphia Connection" no other Cuse players scored in double figures. In fact, outside of Rick Jackson and Scoop Jardine, no one else on the team made more than two shots from the floor! Where do we begin? James Southerland made just 1 shot from the floor in 16 minutes, unfortunately he took 9 of them. He finished 1 of 8 from 3-point range with 3 rebounds and 1 block. He looked a little better defensively than in the Canisius game, however his shooting was abysmal. He averaged 1 3-point attempt per 2 minutes on the floor, and since he was in for 16 minutes and only hit 1 shot, it was very painful watching him play last night. As a team, Syracuse shot 2-17 from 3 in the first half and finished 7-30 (23.3%). Fab Melo played just 15 minutes attempting 2 shots and hit 1 of them. Melo finished with just 2 points and zero rebounds in 15 minutes, however he did record 2 blocks and didn't foul out of this game. So that's something to build on. Hopefully he gets these "learning experience" games out of his system before the real competition heats up. Again, you can't expect a player with just 1 season of basketball in America to immediately dominate the inside. It takes time to adjust, especially when you are coming from another country and have played just one season of American high school basketball. Baye Moussa Keita looked solid off the bench. In 22 minutes Keita shot 2 of 3 from the floor and scored 7 points with 4 rebounds with a team high 3 blocks. Expect big minutes from Keita while Fab Melo continues to find his game at the college level. He played terrific defense and his wingspan is very impressive. If you want to find the SU player that disappointed the most, look no further than Kris Joseph. In 19 minutes Joseph finished 0-5 from the floor, 0-3 from long range, 3-6 from the foul line and fouled out of the game. Every time he tried to put the ball on the floor Detroit collapsed on him and he lost control. When he didn't lose the ball, Detroit was taking the charge on Joseph. And when he put up a long range shot, he missed. The good news for Joseph is that he can't have a worse game than he did last night. Kris Joseph is one of the most important players on this team, and if Syracuse wants to get wins against #2 Michigan State and the rest of the Big East than Kris Joseph is going to have to find his game, and find his jump shot. For the complete box score, you can click here. Spoiler alert: It doesn't get any prettier for the rest of the team. The quote of the night came from Jim Boeheim's post game press conference: "I don't mind if a guy takes a shot and tries to make it, but when they start aiming it and can't get to the rim, then you're not a college basketball player. We have some guys who need to figure out whether they are, or aren't really quick because we don't have a lot of time." The Orangemen will get a chance to atone for their awful, awful shooting and shot selection Sunday against William & Mary at 2PM. This is the 2nd game of the warm up leg of the Legends Classic and the game will be televised on SNY, although right now it looks as if it will be tape delayed. They are scheduled to be on TV at 5PM. The Syracuse Orangemen will play their third game in five days tonight when the Detroit Titans enter the Carrier Dome. Tip-off is at 7PM and the game will be broadcast on ESPN3. Detroit comes to Syracuse from the Horizon League, and lost their season opener to New Mexico 63-54. Both teams combined for 40 turnovers and Detroit shot 4-22 from 3-point range. Detroit lost 8 players from last year's squad that went 20-14. Head coach Ray McCallum's teams generally play strong team basketball, and usually lead the Horizon League in most defensive categories, including steals, blocks, rebounds, 3-point defense and field goal percentage allowed. Detroit center Eli Holman lead the Titans with 15 points 13 rebounds in the losing effort. Holman, a 6'10" 255 pound junior, will be the first big center Fab Melo will match up against in college, and it will be interesting to see how he handles playing the big man. 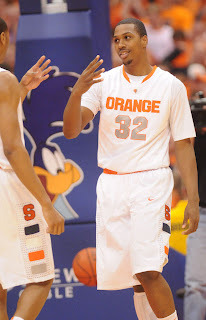 In his first two college games, Fab Melo fouled out and was held to just 6 total points. Last season Holman averaged 11.8 points and 8.9 boards. Ray McCallum, (6'1" 185 pounds) a McDonald's All-American and head coach Ray McCallum's son, turned down scholarship offers from Arizona, Florida, Oklahoma and UCLA to play at Detroit for his father. "Little Ray" averaged 22.5 points 7.5 rebounds and 5.5 assists per game in his senior year of high school last season, and took his team to the state finals where he dropped 32 points with 8 rebounds and 7 steals. Other players the Orangemen will want to keep an eye on are Chase Simon (6'6" 210 pound junior) who can shoot and penetrate, and Nick Minnerath (6'8" 220 pound junior) who is also a shooter and a very good athlete. Minnerath was a third-team JUCO All-American last season. For the Orangemen, they are coming off a 86-67 victory over Canisius on Sunday. A game that was followed by a post-game rant from head coach Jim Boeheim, where he called this Syracuse team the "most overrated team he's ever had." Syracuse has been plagued by two slow starts against two weak opponents (Northern Iowa and Canisius), which saw them with just 3-point half time leads in both contests. Rick Jackson has been leading the Orangemen in the low post this season, averaging 15.5 points per game and 10 rebounds per game. Kris Joseph is second on the team in scoring so far this season, averaging 12 points and 6 rebounds per game. Brandon Triche, who Boeheim said wasn't being aggressive enough after the season opener, scored 16 points on Sunday after a 5 point effort against Northern Iowa. Fab Melo has struggled adjusting to basketball at the college level, having fouled out of both games so far this season. Off the bench, Baye Moussa Keita has been a real nice surprise. On Sunday against Canisius, Keita grabbed 15 rebounds to lead the Orangemen and chipped in 6 points on 3 of 5 shooting. Also coming off the bench has been freshman C.J. Fair. He is averaging 8.5 points over his first two games of his college career and scored 11 points with 4 rebounds on Sunday. With a win tonight, Syracuse will improve to 3-0, however most Syracuse fans will be looking for a strong start from the team. After Boeheim's comments on Sunday, one would expect Syracuse to come flying out of the gates and get all over Detroit. Check back with The Cuse Connection for a complete post game report and analysis. There was a full slate of games on the schedule this week in the Big East. Our very own Syracuse Orangemen knocked off the Rutgers Scarlet Knights in New Jersey 13-10, and improved to 4-2 in Big East play, 7-3 overall. Elsewhere in the conference, Pittsburgh and Connecticut got things started Thursday night in East Hartford, Conn. Behind 222 rushing yards by Jordan Todman, the Huskies managed to upset the Pittsburgh Panthers 30-28 at Rentschler Field. Down by 9 points with under 5 minutes to go Jon Baldwin caught a 20 yard touchdown pass to cut the Huskie lead to 2, however Connecticut managed to convert a huge 4th and 1 from their own 19 yard line and run out the clock to ensure the upset victory. The loss drops Pittsburgh to 5-4 on the year, and it was their first Big East loss of the season (3-1). Connecticut now improves to 5-4 on the year and evens their conference record at 2-2. South Florida and Louisville met up with each school just 1 win away from bowl eligibility. Louisville's Justin Burke threw a 10 yard touchdown pass to Josh Bellamy with just 1:21 left in the fourth quarter to force overtime. However, USF kicker Maikon Bonani drilled a 37 yard field goal in overtime to give the Bulls the victory and bowl eligibility. Burke finished with 146 yards and 3 TD passes (one interception) for the Cardinals filling in for the still injured Adam Froman. Bilal Powell returned for the Cards and ran for 140 yards on 31 carries. B.J. Daniels threw for a very unimpressive 87 yards for USF, and 1 TD. The Bulls are now 6-3 on the year, 3-2 in the Big East. Louisville's record is even at 5-5, still just one win away from becoming bowl eligible, and 2-3 in conference play. Lastly, West Virginia smoked Cincinnati at home, dropping the Bearcats 37-10. Geno Smith threw for 174 yards and 4 touchdowns (1 INT) and lead the Mountaineers into the locker room at half time up 30-3. Zach Collaros threw for 221 yards and zero touchdowns with two interceptions. Cincinnati, who won the Big East Championship the last two seasons, is now 3-6 on the year, and just 1-3 in the Big East. West Virginia improves to 6-3, 2-2 in the conference. Next week there's another full slate of games. Pittsburgh travels to South Florida and Louisville hosts West Virginia, both games kick-off at noon. At 7PM Syracuse will host Connecticut in the Carrier Dome and Rutgers will travel to Cincinnati. 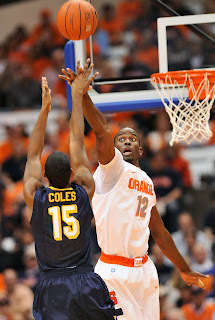 On Sunday afternoon the Syracuse Orangemen defeated Canisius College 86-67 in the Carrier Dome in front of 20,454 fans. 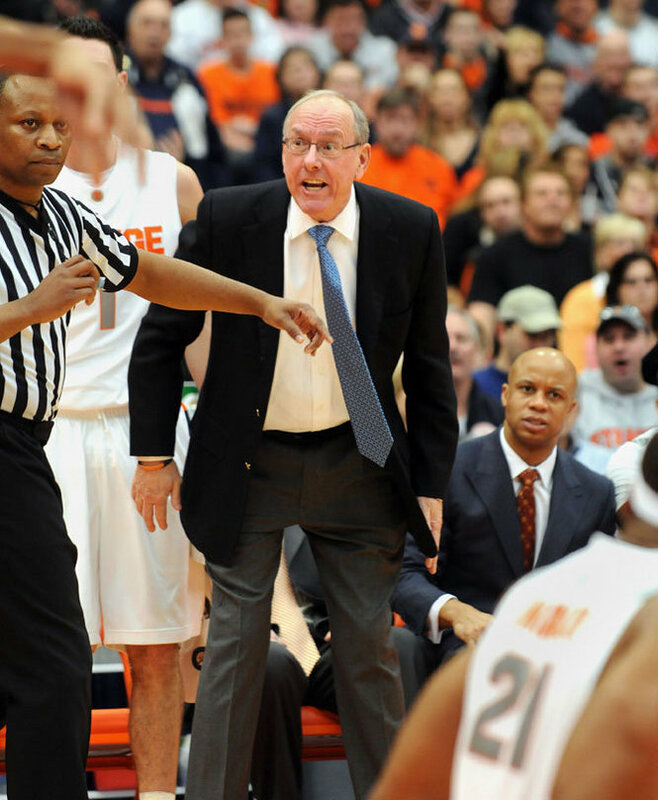 However, what happened on the court was nothing compared to Jim Boeheim's post-game press conference. Jim Boeheim got things started early in the press conference, saying he needed to "clarify some things," and then told the room of reporters that "we have no depth. Everybody talks about 'this guys a great player,' we don't have one guy who's made a significant play in a college basketball game." Then he asked the media assembled to give him one player who has done anything coming off the bench this season. Jim Boeheim went on to say that "we have four guys," meaning Rick Jackson, Scoop Jardine, Brandon Triche and Kris Joseph. "We're going to go where our veterans take us... you can count on that." "Watch the tape of the first half tonight, and tell me how many games you think we're going to win with that depth that was out there... We need to get realistic. Right now we're the most overrated team that I've ever had. Right now. And I'm a little shocked that every body's bought into this whole thing." "We have got a long ways to go, and we have a lot of work to do." Jim Boeheim made it very clear. However, it's a little curious to hear from a man who told us that Fab Melo was going to be a national rookie of the year candidate and that Dion Waiters was one of the best freshman guards he's ever had at Syracuse. Apparently the team got a little ahead of themselves and needed to be taken down a few pegs. When considering the first half performances in the two regular season games we have played this season, he has a point. Syracuse held just a three point lead for the 2nd straight game at halftime, and looked extremely sloppy with the ball, especially around the rim. The Orangemen were held to just 23 points in the first half of the Northern Iowa game. On Sunday, Syracuse scored 32 points in the first half. Considering the level of competition, that's completely unacceptable. Rushed 3-pointers and blocked shots inside are no way to run the offense. Given Syracuse's extreme size mismatch inside, how are they settling for outside shots? Things weren't all bad for the Orangemen on Sunday, they did win the game by 19 points and outscored Canisius 54-38 in the second half. Rick Jackson finished the afternoon with 17 points to lead the Orangemen and added 13 rebounds 3 assists 2 steals and 4 blocks with just 2 turnovers. Kris Joseph struggled early and finished with 10 points on 3-9 shooting from the floor with 7 rebounds and 2 assists. Scoop Jardine, who scored zero points in the opener against Northern Iowa, dropped 13 points and had 8 assists on 5 of 11 shooting including 2 of 3 from 3-point land. Brandon Triche, who Boeheim criticized following Friday's game for not being aggressive enough, shot 6-13 from the floor, 4-8 from three, and finished with 16 points. Off the bench no one could keep up with Baye Moussa Keita. Keita grabbed a team high fifteen rebounds and added 6 points on 3 of 5 shooting in just 17 minutes. Baye Moussa Keita had 9 offensive rebounds, however was 0-4 from the foul line after not missing a shot from the charity stripe in the exhibition schedule. C.J. Fair also contributed off the bench, giving the Orangemen 11 points in 18 minutes to go along with 4 rebounds. Dion Waiters was 1-5 from the floor and finished with 3 points in 13 minutes of action, afterwards Boeheim called Waiters a "non-factor today." Another struggling Orangeman was James Southerland who shot an ugly 1-9 from the floor in 9 minutes of action with just 2 rebounds and 2 points. His defense wasn't much better and played a very uninspired game. Lastly, there is Fab Melo. In just 13 minutes of action Fab Melo did his best Daryl Watkins impression and fouled out of the game, for the second game in a row. He finished with 4 rebounds and 2 points. In two regular season college games, the only thing that Melo has 10 of is fouls (6 points, 7 rebounds, 0 blocks). As we stated in our season preview, Fab Melo just has played just 1 year of American basketball in his life. There is definitely going to be an adjustment period and right now other teams are going right at him and forcing him to make a play. Going from high school to college and playing as a freshman is hard enough as it is, and considering he only has 1 year of high school ball in this country, that adjustment is going to be even harder. 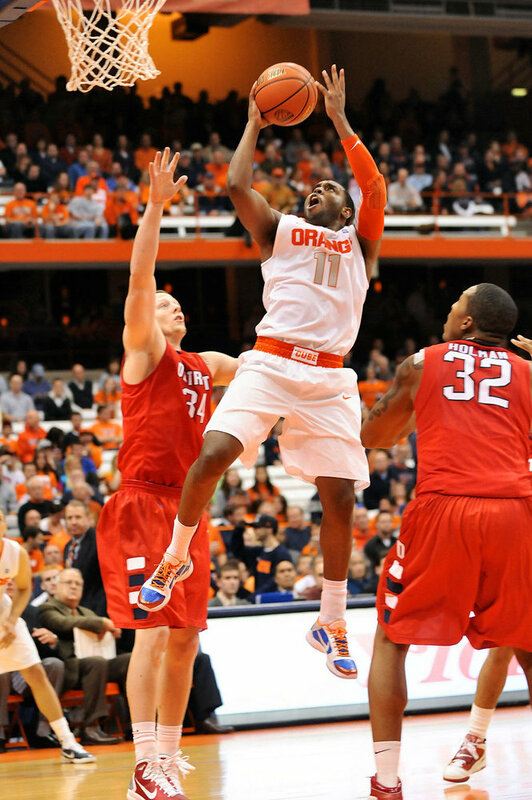 The Syracuse Orangemen's next game is Tuesday in the Carrier Dome when they host the Detroit Titans. The Titans lost their season opener to New Mexico 63-54. Tip-off on Tuesday is 7PM. The game will be broadcast on ESPN3. After knocking off last year's Cinderella team Northern Iowa in the Carrier Dome on Friday night 68-46, the Syracuse Orangemen are going right back out on the court today to take on the Canisius Golden Griffins out of Buffalo, NY. Tip-off is at 3PM and the game is being televised live on ESPNU. Fab Melo fouled out in just 18 minutes of action on Friday and will look for a bounce back game today. Scoop Jardine was held scoreless and Brandon Triche heard some criticism from head coach Jim Boeheim following Friday night's game, so both players should have a little extra fire in their game. Dion Waiters had a terrific college debut contributing 10 points on Friday night, and C.J. Fair added 6 points in only 8 minutes on the floor. Rick Jackson and Kris Joseph were both solid, with each scoring 14 points in the win. The Golden Griffins will have a few familiar faces on their roster. Forward Elton Frazier went to Corocan High School and Alshwan Hymes went to Jamesville-DeWitt, a teammate of Brandon Triche. Triche said Hymes is "like a brother" and the pair won two state championships in basketball together. They still speak multiple times a week via telephone. Cuse fans should also be sure to watch out for Julius Coles (6'4" 183 pounds) a senior who is a good transition player and can knock down the three pointer. He has been a contributor for Canisius since arriving on campus his freshman year. Be sure to check back Monday for full post-game report and analysis from The Cuse Connection. Needing just one victory to declare themselves bowl eligible for the first time since the 2004 season, the Syracuse University football team traveled to Rutgers Stadium in Piscataway, NJ. With the weather turning from warm and sunny to brisk and dark and the game knotted at 10-10 with 3:51 left in regulation, the Syracuse football team got the pigskin back for the offense following a missed 45 yard field goal attempt by Rutger's San San Te. Syracuse got the ball on their own 33 yard line. Sixty-seven yards between the Orangemen and the post season. With Alec Lemon inactive due to an arm injury, forgotten receiver Marcus Sales was back on the field, and making his presence known. On the final drive of the game, Sales grabbed two catches for 20 yards and Antwon Bailey provided 37 yards on the ground to help keep the chains moving for the Orangemen. Delone Carter chipped in roughly 10 yards on the drive, and Syracuse was set up 1st and 10 at the Rutgers 16 yard line. After three safe plays Doug Marrone called upon Ross Krautman to come on and try to give Syracuse the lead. Just like he has done all season, Ross Krautman (out of Franklin Lakes, NJ) trotted onto the field with nothing but ice water in his veins. Ross Krautman, playing like a man possessed this season, drilled the 24 yard field goal to give Syracuse a 13-10 lead, and Syracuse fans everywhere were 1:09 away from seeing the unthinkable. The defense followed the offense onto the field and held Rutgers to a turnover on downs to secure the win for the Orangemen. The win, Syracuse's fifth on the road this season, leads the nation, and gives Syracuse a perfect four road wins in four tries in the Big East. This is the first time Syracuse has ever won four Big East road games. After the game senior punter Rob Long said it all. "It's awesome. We had tears of joy. We knew we did it as a team." Doug Marrone said after the game that "they're a team of great character. They trust in each other. They believe in each other." For all the years of heartache and just truly ugly, ugly football under the tutelage of Greg Robinson, Doug Marrone has returned to Syracuse University and lead the Orangemen back to the post season in just two seasons. The prodigal son has returned to pull Syracuse out of the depths of football obscurity, out of the doldrums of irrelevance, and has returned the Orangemen not just into respectable competitors, but into victors as well. 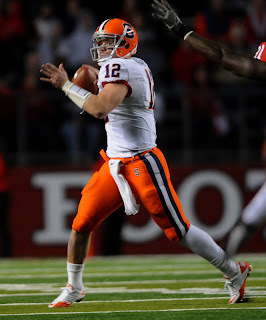 Ryan Nassib finished the day completing 16 of 31 passing attempts for 214 yards 1 touchdown and 1 interception. Nassib was sacked six times, however made the plays in the final minutes of the game to lead the Orangemen down the field and into scoring range. Marcus Sales, filling in for injured Alec Lemon, played unbelievably hauling in 5 catches for 73 yards to lead Syracuse, and Nick Provo added 4 catches for 60 yards. Antwon Bailey caught the lone touchdown pass and finished with 44 receiving yards to go along with 50 rushing yards (94 total yards on the day). Bailey also had a fumble late in the first half, although it didn't end up costing the Orangemen. In fact, Syracuse turned the ball over three times in the first half, however they held the Scarlet Knights to just 3 first half points. The loss drops the Rutgers Scarlet Knights to 4-5 on the year, and just 1-3 in the Big East. Rutgers ran for 216 yards, mainly out of the wildcat. One facet of the game not found on the stat sheet was the number of times Rutgers players stayed down after the play seemingly injured only to be seen moments later in perfect health and going right back into the game. Someone should look into how many extra time-outs Rutgers gets from those shenanigans, because it was happening all game. Particularly in the second half. Syracuse has two home games remaining on their regular season schedule, before their long awaited trip to a bowl game. Saturday Syracuse will host Connecticut at 7PM and the following Saturday, the Orangemen will host former Big East foe Boston College in the regular season finale. After a lackluster first half inside the Carrier Dome, the Syracuse Orangemen entered the locker room up 23-20. The Northern Iowa Panthers played tremendous defense and took very good care of the basketball for 20 minutes to hold Syracuse to just 23 points. Thankfully, after a half time pep-talk from Jim Boeheim, the Orangemen burst out of the locker room and outscored Northern Iowa 45-26 in the second half en route to a 68-46 Syracuse victory in front of 22,198 fans in the Dome. Fab Melo converted the first field goal of the season to give the Orangemen a 2-0 lead, a surprising 3 scoreless minutes into the game. Fab Melo would foul out of the game in just 18 minutes of playing time in his college debut. He finished with 4 points on 2-3 shooting from the floor with 3 rebounds and 1 steal. Speaking of freshman debuts, Dion Waiters was extremely impressive in his first regular season game. Chipping in 18 minutes, Waiters scored 10 points on 3-6 shooting from the floor (2-4 from 3), with 1 steal 1 rebound and zero turnovers. Apparently he saves his "A" game for when the games count. The most impressive Orangemen on this night were Rick Jackson and Kris Joseph. Each scored 14 points to lead the Orangemen and Jackson added 7 rebounds 4 assists 2 blocks and 2 steals (along with 3 turnovers), to help Syracuse earn the win. Joseph also grabbed 5 rebounds and dished 2 assists in 29 minutes of action. C.J. Fair got 8 minutes of game time, and was 3-3 from the floor for six points in limited action. He also picked up 1 block and 1 steal in the game and had the lone monster jam of the night. Scoop Jardine played just 19 minutes and was held scoreless shooting 0-7 from the floor with 4 assists and two turnovers. After the game Boeheim said that Brandon Triche needs to be more aggressive and stated that he has "not found his way." Coach Boeheim added that Triche is playing very conservatively, and needs to be more aggressive on the offensive end. In 32 minutes Brandon Triche had 5 points on 2 of 5 shooting (1 of 3 from three). The win was Jim Boeheim's 830th All-Time and ties him for 5th on the All-Time coaching wins list with Mount Saint Mary's coach Jim Phelan. Syracuse's next game is today (Sunday) at 3PM on ESPNU when Syracuse takes on Canisius. Syracuse Basketball Season is Officially Back Tonight! After completing the exhibition schedule with games versus division II Kutztown and LeMoyne, the Syracuse Orangemen are ready to kick off their regular season with a home match up against the Northern Iowa Panthers. Tip off is at 7PM tonight, and the game will be broadcast on ESPN3. Northern Iowa, who made a surprise appearance in last years sweet 16 after knocking off #1 seed Kansas in the 2nd round, returns 8 players and two starters from last year's squad. Kwadzo Ahelegbe is the teams leading returning scorer and runs the point for the Panthers. They also have two 3-point scoring threats in Johnny Moran (6'1" 190 pounds) and Kerwin Dunham (6'6" 200 pounds). Jake Koch (6'9" 255 pounds) can also knock down the outside shot and can score inside as well. He could prove to be a difficult match up for the Orangemen. Anthony James has also been a scoring threat off the bench for Northern Iowa. During their exhibition schedule, he dropped 10 points against Wartburg and a team high 6 rebounds against University of Mary. In terms of defense, Northern Iowa was 2nd in points allowed in the nation last season, allowing just 55.2 points per game. The Panthers have also made the NCAA tournament 5 out of the last 7 seasons. However, the Panthers have never beaten a Big East team (0-8). Since 2002-03 Northern Iowa is 7-9 against ranked opponents. They last beat a ranked opponent on the road when they knocked off Wichita State (#16) in 2006-07. We learned quite a bit about this year's Syracuse squad during the exhibition schedule. First thing is that this team can make foul shots. They shot 90% from the line as a team in the two exhibition games and hopefully can continue that into the season. Even the big men were efficient from the line, something Syracuse hasn't seen since in ages. Kris Joseph and Scoop Jardine look like two players ready to shine in the starting lineup, and Fab Melo should be the beast in the middle Syracuse fans expected to see when we signed him to a letter of intent. Off the bench, C.J. Fair has tremendous athletic ability and a nose for the ball. He can rebound in the lane and throw home a dunk with the best of them. Baye Moussa Keita, who many viewed as a project, is much further along in his development than we expected. He certainly gets his hands on a lot of loose balls and can knock down jumpers and shots from the foul line. He will not be a push over in the middle. Dion Waiters struggled during the exhibition schedule, but broke out of his funk in time for the 2nd half of the LeMoyne game. We will see if he can continue to make plays for the Orangemen, or if he will have to sit in favor of one of the other players. Rick Jackson is back for his senior season and will provide the leadership and experience on the back end of the 2-3 zone. He will still be a threat to score inside and will be an important player on this team, especially with two freshman as the only options at center. We have been waiting a long time for basketball season to return after last years disappointing finish at the hands of Butler. This is no easy opening game for the Orangemen, and they will need a focused team effort to overcome Northern Iowa. Smart passes, tough defense, and efficient possessions will be the key to victory on this day. Be sure to check back with The Cuse Connection for post game recap and analysis. Northern Iowa Scouting Report: I thought I told you to shave those sideburns, Mattingly! Before getting to it, I'd like to recognize the crowd at the Dome for Tuesday's exhibition game against LeMoyne. 11,000 fans showed up. For an exhibition game. An EXHIBITION GAME. ELEVEN THOUSAND. Awesome. Friday, the regular season tips off against the University of Northern Iowa Panthers. Last year, UNI went 30-5 and ran away with the Missouri Valley Conference. In the NCAA tournament, the Panthers defeated top-ranked Kansas in a memorable upset on the wings of Ali Farokhmanesh. As Farokhmanesh launched that uncontested-but-uneccessary three up one with 30 seconds to play and 29 on the shot clock, I remember thinking "wow, that might be the stupidest shot I've ever seen." When it went in, I still thought it was stupid. The 2010-11 team has lost a few key players: seven-footer Jordan Eglseder, MVC POY Adam Koch and Farokhmanesh. The new frontcourt will be anchored by Jake Koch (6-9, 255), Adam's younger brother. Koch was a strong performer at the end of last season and is a mild threat from outside, making 16 of 40 threes (40%) in 09-10. Freshman Chip Rank (6-6, 215) and two time MVC 6th Man Lucas O'Rear (6-6, 260) will join Koch up front. Notably, O'Rear dominates the competition in an often overlooked stat category: mutton chops. The backcourt will be the Panthers' strength. Senior Kwadzo Ahelegbe steps into a leadership role, and much of their season will depend on if he embraces the new responsibility. He's not alone - junior Johnny Moran returns as well. Coach Ben Jacobsen is relying on Ahelegbe and Moran to fill in the scoring gaps left by their departed stars. UNI will take a step back this season, but they are a well coached team that will out-hustle any squad in the country. Tune in to ESPN3 on Friday, November 12th at 7pm. This is the toughest opening game matchup that Syracuse has faced since Memphis in that memorable 2002-2003 season. BASKETBALL SEASON HAS ARRIVED! REJOICE! Saturday the Syracuse Orangemen will travel to Piscataway, NJ to take on the Rutgers University Scarlet Knights. Rutgers, coming off a ten day lag between games, will try to prevent the Orangemen from going bowling on their home turf. Syracuse will be looking for a bounce back win after a very disappointing home loss to the Louisville Cardinals last Saturday in the Carrier Dome. Kickoff is scheduled for 3:30PM. The Scarlet Knights enter the game sporting a 4-4 overall record, with a 1-2 record in the Big East. They last played a Wednesday night game against South Florida, in which they blew a five point 4th quarter lead and fell to the Bulls 28-27 at Raymond James Stadium in Tampa, Florida. Last year Syracuse and Rutgers met up in the Carrier Dome. Rutgers came in ranked 25th in the country, and left sporting a 31-14 whooping at the hands of the Syracuse Orangemen. On that day Syracuse wracked up 424 total yards against a defense that was ranked first in the Big East, and sacked Rutgers quarterback Tom Savage nine times. The Orangemen also controlled the clock, dominating the time of possession 40:01 to 19:59. This year expect a much hungrier Rutgers team. Not wanting to get embarrassed at home like they were last year in Syracuse, the Scarlet Knights will rely on true freshman quarterback Chas Dodd, who hails from Lyman, South Carolina. Dodd took over the starting job in October and has completed 77 of 132 passing attempts for 956 yards and 5 touchdowns. Chas has also thrown 3 interceptions and been sacked 21 times. Additionally, Dodd hasn't thrown a touchdown pass since October 16th against Army. The Scarlet Knights have three runners at their disposal in the backfield, which is rated 104th in the nation in total yards. Joe Martinek, who has 83 carries for 277 yards and 4 touchdowns. Martinek also has 6 catches for 39 yards, however he rushed only 9 times in the South Florida game last week or a total of -6 yards, though he did find the end zone once. The week before in Pittsburgh Martinek had 13 carries for 52 yards. If not for a 109 yard effort against Norfolk State to open the season, his numbers would be much lower. Rutgers also enjoys deploying the wildcat formation, in which true freshman Jeremy Deering proved to be successful in the USF game last week. Deering rushed for 69 yards on 9 carries and also has 12 catches on the year for 249 yards and a touchdown. Jordan Thomas, who can play wide receiver and running back, played high school football with Syracuse's own Chandler Jones in Endicott, NY and has rushed 61 times for 213 yards this year along with 12 catches for 149 yards. Jones used to block for Jordan Thomas in high school, however this time Jones will look to block Thomas from getting past the line of scrimmage. There's another cat Syracuse will have to watch out for and its Mohamed Sanu, who is a versatile football player. He has rushed 54 times this year for 285 yards and 4 touchdowns, and caught 40 passes for 389 yards and 2 scores. Last week against USF he grabbed 7 passes for 48 yards and threw for a touchdown in the loss to the Bulls. He has been fighting through an ankle/foot injury all season, although he has yet to miss a game. At wide receiver outside of Sanu, Mark Harrison has caught 21 balls for 373 yards and 4 touchdowns. Additionally D.C. Jefferson has 10 catches for 166 yards and a touchdown, and a really cool name. Jefferson is a 6'6" 258 pound junior and lines up at tight end for Rutgers. The Scarlet Knights are averaging 21.9 points per game, which ranks 95th overall in the country. The Scarlet Knights defense allows 20.1 points per game, which is 31st nationally. The defense also allows 321.8 yards per game, which ranks 26 in the country. The Syracuse Orangemen enter the game 6-3 overall, 3-2 in Big East play and just 1 win away from securing their first bowl birth since the 2004 season. Many wished that elusive 7th win would come at home last Saturday against Louisville, although those dreams were crushed by the visiting Cardinals. Now the cuse gets a second chance to get back to the post season, and with a large contingent of Syracuse fans expected to descend upon Rutgers Stadium on Saturday, they will not be alone. Syracuse defenders allow just 299 yards per game on average, 10th best in the nation. Allowing just 18.7 points per game, the Orangemen rank 16th in the country and will look to feast on a Rutgers offense that they sacked 9 times last year in the Dome. On the injury front, Alec Lemon was spotted wearing a soft cast on an arm, although said it wasn't a sprain or a break, just swelling. He is expected to be ready to play on Saturday, as is Van Chew, who is recovering from some "bumps and bruises." Offensive lineman Michael Hay, who sat out last Saturday's game with a foot injury, is expected to play however has not been officially ruled active for the game yet. Ryan Nassib currently has completed 138 of 246 passing attempts for 1,563 yards and 15 touchdowns with just 5 interceptions. His leading targets have been Van Chew (33 catches for 519 yards and 5 touchdowns), Alec Lemon (29 catches for 365 yards 4 touchdowns), and lately Nick Provo (25 catches for 262 yards and 1 score). Nassib has also found comfort throwing to Antwon Bailey out of the backfield, connecting for 22 catches for 210 yards and 2 scores. On the ground Delone Carter and Antwon Bailey are leading the way. Carter has 853 yards on 161 carries and currently sits 5th on Syracuse's All-Time Rushing list. He is 145 yards behind the #4 rusher James Mungro. Carter is averaging 5.3 yards per carry and has rushed for 7 touchdowns. Antwon Bailey has 79 carries for 380 yards, and is averaging 4.8 yards per carry with one rushing TD. The Kickoff is scheduled for 3:30PM and the game will be televised live on ESPNU. With a win on Saturday, Syracuse will push their record to 7-3 and achieve bowl eligibility for the first time since the 2004 season. In the tragic event of a loss, Syracuse will get two chances at home to pick up the elusive win. First against Connecticut and then the regular season finally against former Big East Conference foe Boston College. The Cuse Connection will be tweeting live from the scene at Rutgers Stadium all afternoon, so be sure to follow @CuseConnection on twitter to get all the updates! The 2011 Syracuse Men's Lacrosse Schedule is Out!